Make the holiday spread bright and merry with our Merry Crunchmix recipe. 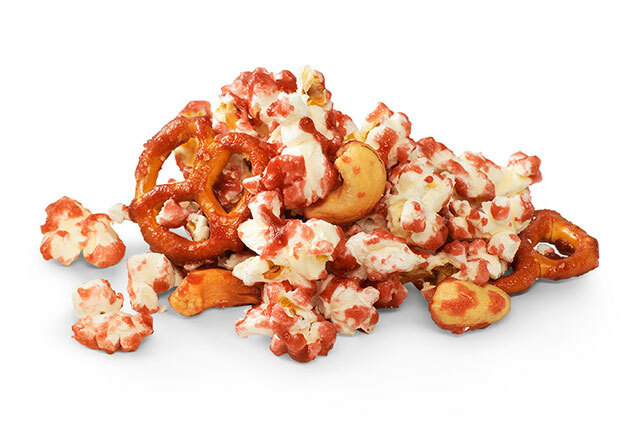 Red gelatin adds vibrant color to our Merry Crunchmix recipe, which comes with a crunchy combination of pretzels, popcorn and cashews. Line 15x10x1-inch pan with foil or waxed paper. Combine popcorn, pretzels and nuts. Cook butter and syrup in saucepan on low heat until butter is melted. Add sugar and dry gelatin mix; cook and stir 2 min. or until gelatin is completely dissolved. Bring to boil on medium heat; simmer on low heat 5 min. Pour over popcorn mixture; toss to evenly coat. Add to prepared pan; use 2 forks to spread into even layer. Bake 10 min. ; cool. Break into small pieces. Substitute PLANTERS Lightly Salted Dry Roasted Peanuts for the cashews.